The early art of Ireland was influenced by Celtic culture. 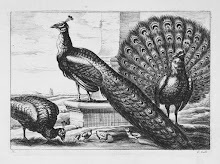 Known as Insular art it was highly ornamentalwith spirals, knot work, key patterns, crosses and zoomorphic imagery. 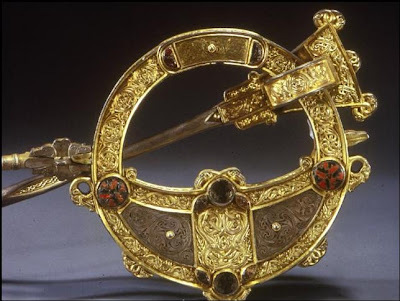 One of the greatestexamples of metalwork during the Christian era of Insular art is the Tara Brooch. The decorative pin dates from theeighth century and is fabricated from silver, gold and copper filigree with inlay of amber and glass beads. Created for a wealthy man, the design motif on front and back iscomposed of wolves heads and dragons faces. Named after the legendary Hillof Tara, seat of the High Kings ofIreland it was actually found in County Meath, Ireland during the mid nineteenthcentury. It is now displayedin the National Museum of Ireland inDublin. Also in Dublin is theilluminated manuscript The Book of Kells atOld Library at Trinity College. 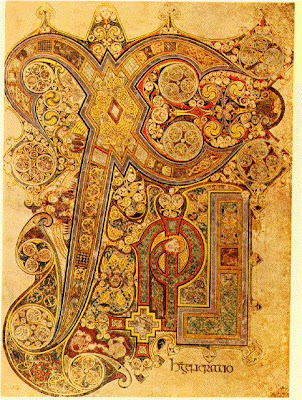 The masterpiece was produced at the beginning of theninth century either in a monastery on the Isle of Iona, Scotland or at Kells in County Meath by Celtic monks transcribing the Four Gospels. The ornamental calligraphic script was written on vellum by several artists who used as many as ten different rare and expensive dyes to render the intricate illustrations. Most famous and beautiful of the books pages is the Chi Ro page which has made people think the manuscript was the work of angels. 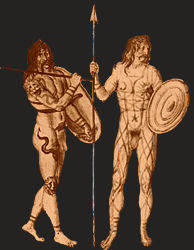 Despite their artistic accomplishments the ancient Celts were often depicted as barbaric tribes as in the engraving by Flemish artist Lucas de Heere (1534 – 1584).